Global Financial Centers Index (GFCI)- considers the business environment, financial sector development, infrastructure, human capital, and reputational factors. Doing Business (DB)- presents indicators on business regulation and the protection of property rights. Global Innovation Index (GII) - indicates the innovation of different cities. Deloitte believes that Hong Kong, which is a long-established financial center, ranks highly on the GFCI yet lower than that of London, Singapore, and New York. Although higher than London and New York in terms of DB, Hong Kong has the lowest GII among the five cities. "In fact many small and medium-sized enterprises in Hong Kong may not be well served by banks and large financial institutions. Therefore, they may expect services from emerging FinTech companies, including e-commerce, payment, microcredit, crowdfunding, and other platforms," said Freddie Chui, Deloitte China Southern Region FSI Leader. He further explained that some small and medium-sized enterprises in developing countries, may find it very challenging to acquire loan financing. FinTech orgnizaitons such as P2P lending platforms can provide them with another cost-effective financing channel which brings them the required funds for sustainable business development. However, few FinTech organizations in Hong Kong are providing such services. Instead, they often follow their counterparts in Europe and the U.S. developing wealth management products based on Big Data Analysis and Robo-Advisory. Thus, founders of FinTech organizations often regard Hong Kong as a market with few opportunities, high costs, and conservative risk preference. Deloitte believes that Singapore moving up to the second place surpassing New York is mainly attributed to the strong support from the Government, as evidenced by the S$225 million committed to the development of FinTech projects. Other initiatives include the Regulatory Sandbox, Strategic Electronic Payments, International Technology Advisory Panel and Talent Development. 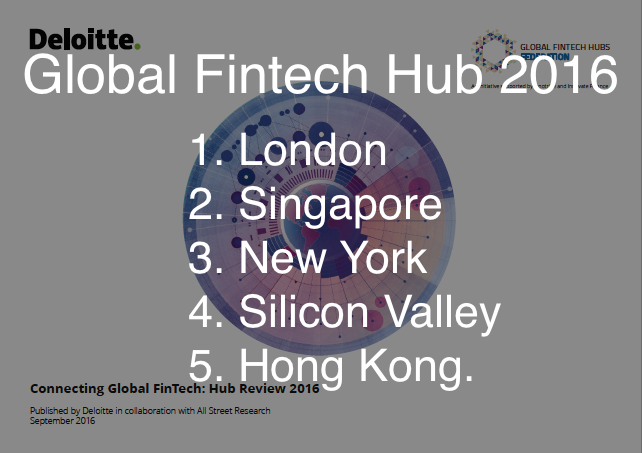 All these initiatives imply that Singapore may be a serious contender for the global No.1 spot in FinTech. Dr. Paul Sin, Deloitte FinTech Consulting Partner holds that many disruptive innovative technologies such as blockchain will inevitably threaten the existence of some traditional financial organizations. Thus, support from the Government is necessary to sustain a leading position in the GFCI. Fully aware of this fact, the Singapore Government has taken some proactive measures such as the establishment of the blockchain platform for trade financing, skipping the time-consuming processes including private financing, educating the market, and individual sales. "While market competition can effectively drive the development of enterprises in the industry, support from the Government for innovation is an effective accelerator for the development of FinTech. This explains why Singapore is leading Hong Kong in all the three indicators," said Dr. Sin. In addition to government support, business innovation is also critical for the development of FinTech. Deloitte believes that Hong Kong, with low innovation index, needs to catch up to maintain its position as one of the leading global financial centers, otherwise it will be less relevant to the global market soon and fall out of the global top five. Dr. Sin believes that high ranking requires the common endeavour of the Government and entrepreneurs. While the Government can provide regulatory and financial support, business innovation is a key factor for the development of FinTech. Entrepreneurs must explore other potential businesses while continuing the development of familiar businesses in accordance with the requirements of the market and the rapid development trends of new technologies. ​Meanwhile, entrepreneurs should observe the structural changes of global and local economy and make frequent contact with potential clients, especially small and medium-sized enterprises which is a group that still remains to be explored. Through these initiatives, enterprises can provide distinctive products that meet the requirements of the market. 1. Global Financial Centers Index (GFCI)- considers the business environment, financial sector development, infrastructure, human capital, and reputational factors. 2. Doing Business (DB)- presents indicators on business regulation and the protection of property rights. 3. Global Innovation Index (GII) - indicates the innovation of different cities.